When I was 18 I took my drivers education course during my March break. It was the best deal for the price I was willing to pay in the whole city. My logic was: at the end of the day we are all given a license that entitles us to drive. So, why not pay 300 dollars less to do so? My plan worked flawlessly and before I knew it I was completing my ten practice lessons with my driving instructor Shiu. Together Shiu and I practiced stopping, turning, parallel parking, one-ways, two-ways, sideways, highways, and any other way you can think of. After all my training I was ready to take the test to get my license. AND… after some confusion behind the words “light it up!” and “hold up!” I was awarded with my G1. I had finally found my freedom. But, there was a problem… Looking back on all the practice I had done with Shiu I feel as if there was something missing. Something that all instructors should consider in future instruction: the art of finding a parking spot. This is where the Medeiros Theory comes into play. I was driving with a friend around the local Wal-Mart parking lot in North Bay when we pulled in and just our luck, it was full. While I was thinking all hope was lost my friend said, “It’s time to put the Medeiros Theory to the test”. My family is Portuguese and I actually have an Aunt and Uncle with the last name Medeiros and so you can imagine that I was slightly intrigued when I first heard about the theory. b. When you enter a parking lot. Your vision automatically picks out a spot closest to where you are. Since we almost always enter at the back of a parking lot, we pick out a spot we can see from our entrance point. Medeiros theory says: Drive right to the front. Think about it. 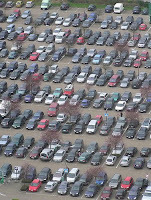 When was the last time you thought “I am going to drive right up and get a parking spot”. Exactly! You haven’t and neither have 90% of the other people who are parking. It just doesn’t make sense, right? Wrong! It makes perfect sense. If everyone is making the parking sacrifice then they are filling up spaces at the back. So, when people who enter the parking lot see all the spots filled they think the lot is full and decide to park at the first spot they see, which is also in the back. Still following? Good. That means, under the Medeiros Theory, there should hopefully be a spot near the front of where you are parking. I always go by this theory! Markham has one of the craziest mall parking lots ever, but I ALWAYS take the chance and drive to the front, and somehow I always find the spot right beside the handicap spots! It's mainly because ppl don't even realize whether or not it's handicap so in I go and voila! Perfect spot! It really works! sean anthony you definitely know how to work a parking lot. I never know anyone put this much thought into it but i like that i now know how to get the best parking spots. I will have to try this next time I am at a busy parking lot. I just feel like its great excersie walking from the car to the store and back haha. At the university I will definately have to try this, although I must say now that all the education students are on placement I find a spot right up front everytime.